There are hundreds of species of army ants in the Amazon rainforest, but they all exhibit the same basic behaviors. Despite their small size, army ants are some of the fiercest animals in the rainforest. To feed their queen and the larva, and to a lesser extent, themselves, they travel through the forest in columns in search of insects and other small animals to attack. They travel in columns with each ant laying down a scent trail for the other ants to follow. Because army ants attack in such large numbers they are able to easily overcome their prey - they attack insects, birds, snakes, spiders, mammals, lizards, frogs, and any other animal that is not able to get away from them. 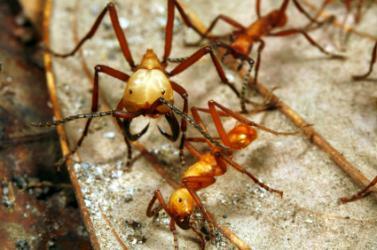 Army ants are blind and communicate with each other by touch, sound, and scent. They locate their prey by their sense of smell and sound. By keeping perfectly still some animals are able to outwit the army ants because the army ants don't notice their presence. Other than the queen, there are two sizes of army ants within a colony - the soldiers and the workers. The soldiers are the largest with huge mandibles and the smaller ants are the workers. The above photo shows a soldier army ant and two smaller worker ants. The soldier army ants use their large mandibles as a defense and it is the smaller workers that are the most dangerous. For a demonstration of army ants in action, watch the You Tube video below for a demonstration of just how brutal army ants are during an attack. This species is not threatened or endangered. Copyright © 2009-2018 RainforestFauna.com All rights reserved.